Plush is Right! I really like this charcoal grey shag rug. It is very thick and has a nice variation of color. It is tightly woven and there is no strings coming loose and no visible backing from the front. The edge has a nice binding and the rug has no strong odor. I am super happy with this and have ordered a larger one for another area in the house. Indulge in the cozy comforting texture of this plush California Shag rug. Its modern grey color instantly brightens up any hardwood or tile floor to create a relaxing atmosphere that allows for a wide range of versatile styling options. I read review after review on numerous rugs. I was nervous, as it seemed there were an equal amount of reviews that were negative and positive. After a month, I finally jumped in and placed my order. I ordered the 9.6"x13" and its exactly what I received. I ordered on a Friday and received it the following Wednesday!! The best way to describe this rug is luxurious and classy. It is super soft, so far does not shed, has no odor whatsoever, and the pile is perfect (about 1.5 inches) and the pile is so thick that you cannot see through to the padding. The padding is woven with tightly weaved thread and does not flake off. Also when you fold the rug, you cannot see through to the padding which is a tell tale sign of a well made rug! The color is exactly as pictured on my screen (my resolution anyways). The rug came folded, so there are a few noticeable fold marks after I laid it out in my space, but none of them major and I expect the fold marks to work themselves out over the next few weeks. I am so happy I finally placed my order! Don't hesitate and order now! I am over the moon ticked pink with this rug, and the price didn't cause me heartburn.. 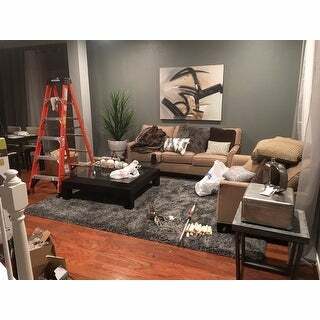 I recently painted my family room in a taupe, but it is a grayish brown color, not a warm beige, Found some new furniture; couch in a cream/ivory color and chair and a half in a gray, they actually call the color gun metal. Looked for weeks for a gray rug that would work, Grays are difficult for me to work with, but I ordered this in a 3x5 as a test. When it arrived I couldn't believe my eyes it was one of the most beautiful shades of charcoal gray that I had ever seen. I took the rug to the furniture store to lay beside the fabric I selected for the furniture. The designer/sales thought it was more beautiful than what they had to offer. Some of their rugs were over $****.**. When they asked me where I got it, I was so proud to tell them Overstock.com, and they were flabbergasted! I'll use this smaller rug in the bathroom and I just ordered the 9'6" x 13 for the family room. Nice and squishy and soft on your feet. It does need a rug pad. I ordered a felt pad for extra cushion. So if you are looking for a gray rug that leans toward cool colors this is the one for you. If you are looking for a gray that is a warmer/brown tone. This is Not the rug to get. This was a hard decision. I kept reading the reviews, which are extremely helpful, and that is why I am taking the time to help other with this review. I first purchased the Safavieh "Milan" 6x9 dark grey/charcoal shag rug, for my salon and I loved it. It was package so extremely well, rolled with material side caps, so no damage done to the ends in shipping..... I knew I wanted this rug for my living room. In the "Milan" the largest was a 10 x 14, but I saw they had a Safavieh "California" cozy plush dark grey/ charcoal shag in a 11 x 15, so I asked what was the difference between the Milan and the California rugs, and the answer was the only difference is size and shapes of the rug, so I order it. The Milan was a very dark charcoal ( a lot of black in the mixture. But the California was more of a mixture of dark and medium greys, which is not my favorite choice for my room color, so now I have to repaint my living room to more of a grey instead of the newly painted taupey/grey. This is not quality of the rug, it is personal choice. The shipping was totally different with this rug, this rug was folded (ugh!) But I am understanding, shipping was free and is costly to Overstock, (which is the reason I didn't return it) it has been a week and the fold lines are slowly coming out, and I will say, I immediately unwrap and unfolded this rug, which was extremely hard due to the size and weight. The reason I gave it a 4 star was only because of the answer that I received from the difference between the 2 brands of Safavieh rugs, which came from Overstock, and I bought the smaller one first to make sure I liked the color. It is a nice quality rug for the price and I love the credit with no interest for 12 months option Overstock gives its customers. Safavieh Cozy Solid Dark Grey Shag Rug We just received this shag rug and it is perfect for our living room. It came rolled up and took a few days for it to completely relax and for the lines to even out. Other reviews were critical of the color. Yes, the grey rug does have blue undertones, but it fits fine with our living room color scheme. We had a very high-end rug prior and this rug is much more comfortable and does not "shed" like our previous rug. I am going to order a smaller second area rug for our entryway, as this is a great product and value! P.S. I have two dogs. One of which has light hair and sheds quite a bit. The hair is not very noticeable and is easily vacuumed out. The dogs LOVE to sleep and rub on the rug! Doesn't Shed, Soft, Comfortable, Withstands kids! I was a little skeptical of buying a rug so cheap. I thought it would shed all over the place and be hard to keep clean since it is a shag rug. However, I am extremely impressed with this rug. I have vacuumed it several times (granted I try to use the hose or an extension of the vacuum) and the rug has barely shed at all! It is extremely comfortable and I don't even use a cushion underneath. Everyone who comes to my house asks what I have underneath this rug to make it so soft and comfortable and I tell them I don't have anything! It's great for laying on, letting kids play on, and it looks great in my living room. I also love the color because it hides dirt and spills extremely well; however, all spills that have happened to us so far have been easily cleaned up on this rug. We have been using this rug for over two months now and I think it's going to stand up well to my kids and living room traffic. I have two very young children and the rug has already undergone spit up, juice spills, blown diapers, etc. etc. All have cleaned up without any fuss and you can't see a single stain on the rug. I would highly recommend this rug to anyone. The rug is a true charcoal/dark grey rug. Love the feel of this rug. It is a beautiful thick and plush rug. I have this rug in my family room and love it! If you are looking for a plush thick shag rug, this is perfect. In stark contrast to the 'nuLOOM Soft and Plush Modern Solid Shag Grey Rug' (called "easy shag"on the tag), this rug is plush and thick, and feels good to the touch. It is a poly fiber rug, colored as advertised, and feels quite soft, thick, and comfortable over a hardwood floor. I've now owned this rug for almost a year, it's been in my teenage child's room, and it has held up wonderfully. I would recommend this rug to anyone looking for a shag rug that feels plush but is also durable. I'm very happy with my choice of this Safavieh Solid Dark Grey Shag Rug. The rug is truly cozy and soft and feels wonderful under my bare feet. 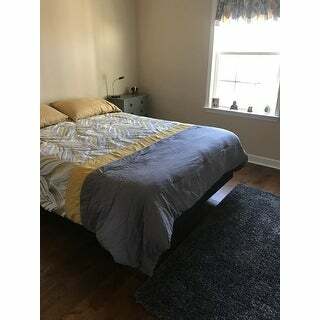 I'm using the rug on my hardwood floor in my guest room, which is decorated in white, light grey, periwinkle blue and a small amount of dark grey. It makes the small amount of dark grey in the bedspread and decorations pop out nicely. I also like the bit of shimmer to the grey color when you move the pile back and forth with your hand/foot. The color is a true dark grey, not an extrememly dark slate color. If this is the color you're looking for in a soft, cozy shag rug....buy it. You won't be dissapointed. Absolutely in LOVE with this rug!!! I purchased two different Safavieh rugs because I wasn't sure of which color/pattern I would prefer. The quality of these rugs is so unexpectedly great that I had to keep both. Even my husband, which was totally against having a shag rug in the formal living room loved it when I placed it there to compare the colors. If you're looking for a high quality shag rug, that doesn't shed, for a great price, look no further. Nice shag, rug that does not have too high of pile height, which keeps it from looking ridiculous. The shag feels very nice beneath my feet in the morning, very modern look with the charcoal color. My cats have enjoyed napping on the plush shag. Very little to no shedding. Would recommend a rug pad as it slides all over on my hardwood floors. Would definitely recommend. This carpet arrived less than 5 days after I ordered it! super soft and comfy (my kids were rolling around in it when I placed it on the floor). I order the largest size (9.5x 13) so it came folded in several places. The folds are still visible but I am hoping they will subside. No odors (as mentioned for other rugs I saw), and the color and texture were great. definetly recommend this carpet. I am very pleased with this rug. I agree with some of the reviewers that the color has a very subtle blue undertone that's noticeable in some light conditions. Even so, I would not describe the rug as being any other color but grey. I bought a plush pad for it, which I definitely recommend for added comfort. I bought this rug for my bedroom. It's awesome! Its super thick and gorgeous! It does have a little hint of blue in it but it's so small that its not that noticeable. 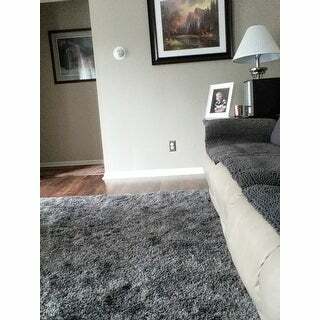 If youre looking for a gray shag rug. This is it! This rug is beautiful and so soft. My grandkids love to lay on it to play games & watch TV. I have purchased 3 of these rugs from Overstock in 3 colors (light gray, dark gray and beige). I first purchased the light grey for our nursery and loved it. Although was not previously a shag rug fan, I got tired of endless rug shopping and ordered the rug at 2am on a whim because customer service promised I could return it for free if it had bad fumes (it did not). So glad I did!! After loving it in the baby's room, I ordered the beige for our bedroom and then ordered the dark grey for the playroom. The best thing about these rugs is that they look expensive, they do not shed at all, our regular vacuum works perfectly fine on them, and the colors are blended (dark and lighter tones in each rug) so they "shimmer" and help tie together different colors in the same family. Lastly, the fibers are NOT shiny. I was very afraid of the synthetic material, but it has a very nice appearance and does not look synthetic at all. We have used this for quite a while now. Kids room with cats and frequent cleaning / vacuuming. Holding up very nice, helps hide dirt and problems due to the color. This is my first purchase and It couldn’t be more perfect! The color is amazing, the style is fun and it’s great quality! I love the color , how plush in is . My daughter will curl up on it and play. I would like to get one to fit each bedroom . The price for this rug was very reasonable so I was skeptical about the quality. I was pleasantly surprised to find it was a thick, fairly dense shag that was also soft! The charcoal color is very modern. Ordered the biggest size for the family room and it comes folded (very heavy) so it takes a few days to flatten out. Also no weird new rug smell that I noticed! This was a huge winner and I'm picky about shag! Definitely would order again, great value for the price. I love this rug, best purchase yet! The quality of this rug is great. It is very soft and plush feeling and I haven't noticed any lost fibers since purchasing. I have vacuumed on a lower setting with no issues/no fibers lost, but wouldn't recommend vacuuming with high powered suction. The color is beautiful, a deep charcoal color, and looks just like the photos. excellent product! Color like photo and quality as described. "I asked size? I meant price for the 9 x 12 I think?" You can choose the size on the product page. "Does the rug have a rubber backing?" This has a sturdy polypropylene backing. I don’t know that it’s rubber backing but it’s beautifully held together and it doesn’t slip and slide. And it is so fun to walk on! I purposely walk on it w/bare feet every morning. One of those little things in life but it puts a smile on my face every time! 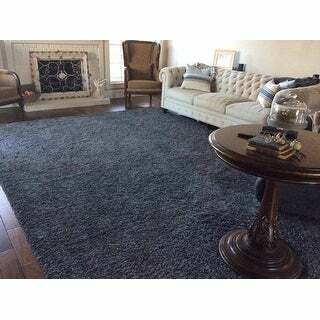 "ITEM# 14790760 if I buy this item what size do I get, as you can see it shows two different sizes Safavieh Cozy Plush Dark Grey/ Charcoal Shag Rug - Dining Room/Bedroom/Living Room - 10' x 14' - 11' x 15' - Rectangle"
Depends on the size you purchase, mine is too big for any size washing machine. This is a heavy shag rug. You would not be able to put it in a washing machine. So, no. "Does it need a base pad?" I do not have one under mine and it still comfortable and soft. It is very thick; I have them in just about every room in my home and very happy with them. I do not use one under mine as it is so nice and shaggy I don't feel it requires one.